Please note that this home is located approximately one mile away in the sister community to Indigo Reef called Coral Lagoon, and is not in Indigo Reef. 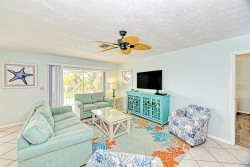 Coral Lagoon Resort, located immediately adjacent to Key Colony Beach, perfectly embodies the relaxing, tropical ambiance that you came to the Florida Keys to experience. Rated #1 specialty resort in Marathon, Florida on TripAdvisor; Coral Lagoon Resort offers incomparable luxury, privacy and resort amenities. Stunning and tranquil, this resort is located on nearly six acres of pristine maintained property and flourishing scenery. The Sea Star is one of the few single-family homes at the resort, not an attached townhome. With windows on all four sides of this home, the interior is bright and sun-drenched. The overall square footage is larger than the townhomes as well. The oversized, covered back porch provides peaceful canal views and features plenty of seating room for lounging in the sun or enjoying the ocean breezes. The outdoor dining area provides seating for up to eight guests. The Sea Star features an airy layout and is professionally decorated in a relaxing sea glass palette. This home was completely remodeled with ALL new furniture, bedding, mattresses, etc. in late March of 2015. Many of the high-quality furniture pieces were selected from the Stanley Coastal living collection. All bedding is Sealy and has mattress encasements. Unwind in the roomy 1st-floor living area featuring abundantly cushioned seating centered around a 55-inch flat screen TV. The gourmet kitchen boasts stainless steel appliances elegant granite counters and cherry wood cabinets. Extra amenities such as an espresso/cappuccino maker and a Margarita frozen drink maker with margarita glasses are also included. Enjoy a quick snack on the stools at the breakfast bar or dine-in at the dining room table that provides seating for up to six people. This home will sleep six people comfortably in beds and also features a Queen size sleeper sofa with a Sealy mattress for 2 more. All bedrooms feature 32 inch, cable equipped flat screen TVs with built-in DVD players. Bringing a boat? Not to worry, Coral Lagoon Resort flawlessly accommodates every fishing and boating need, providing guests with use of the onsite, full-service marina adjacent to the resort grounds. Boat slip which is located directly behind the home is included with your Sea Star vacation rental. I called a couple of times for simple questions but the line was busy. The staff saw my number and call right back. Super friendly. The house was immaculate and had a nice welcome kit. We LOVED staying there and will be looking to return next year! The bed was very comfortable, loved the kitchen will rent again with cocoplum rentals for sure.Thank you for making our stay comfortable for us. The bed was very comfortable, loved the kitchen but next time will will rent again with cocoplum rentals for sure.Thank you for making our stay comfortable for us.